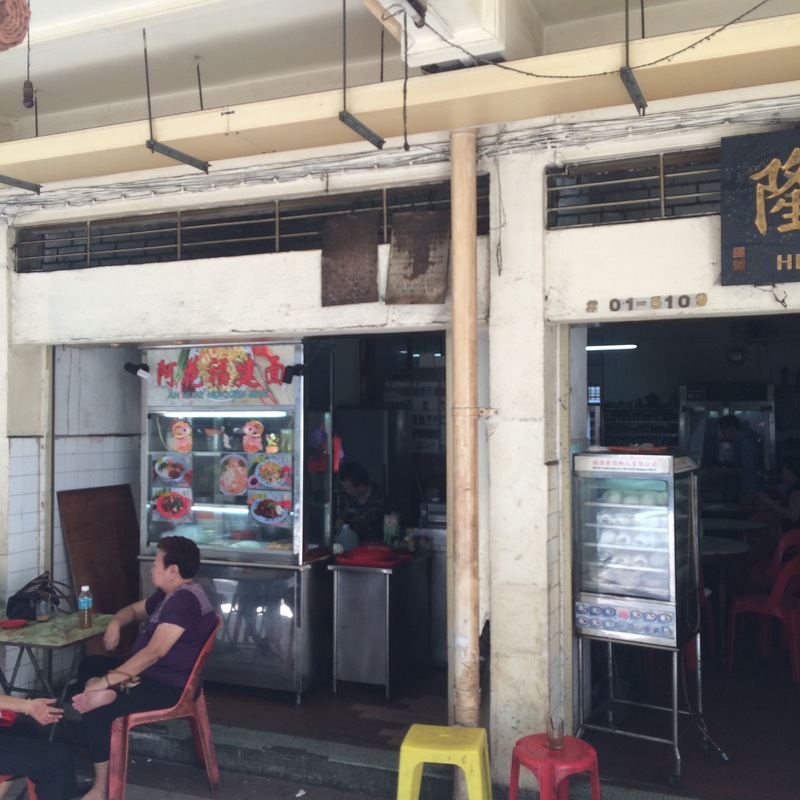 This stall has been around ever since Shunfu Mart renovated. Moved from their origin place at Lakeview, this stall has quite a following. And I learnt that this uncle has been a hawker since he was 19 years old and now he’s 65. Respect. 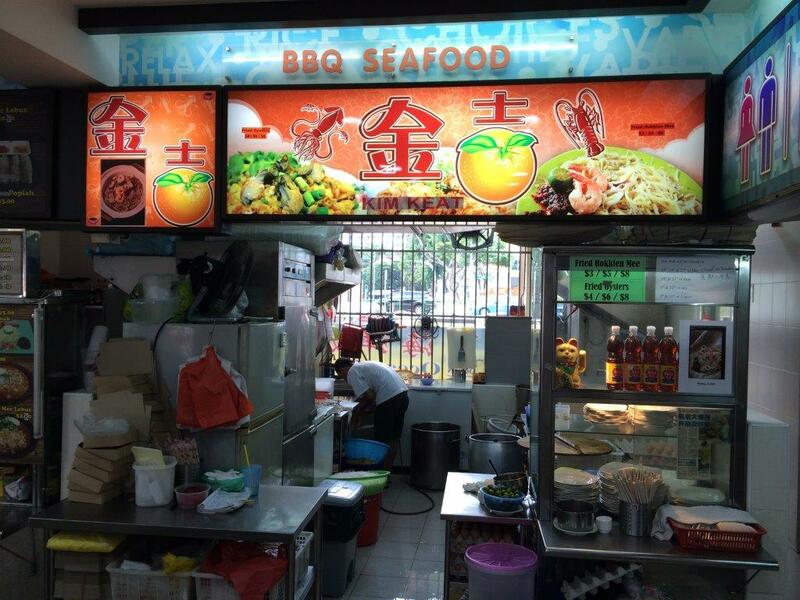 So I decided to give it a try by order both the prawn noodles and the fried prawn mee. Price: $4 for fried, $3 for dry. Ambience: Hawker Centre with very tight seating. My tummy was rubbing on the table. Taste: Dry version has an old school taste to it with ketchup. Soup that came with it looked rich but tasted not too rich. I would prefer a little more umami richness to the broth cos that will affect the taste for the fried one as well. 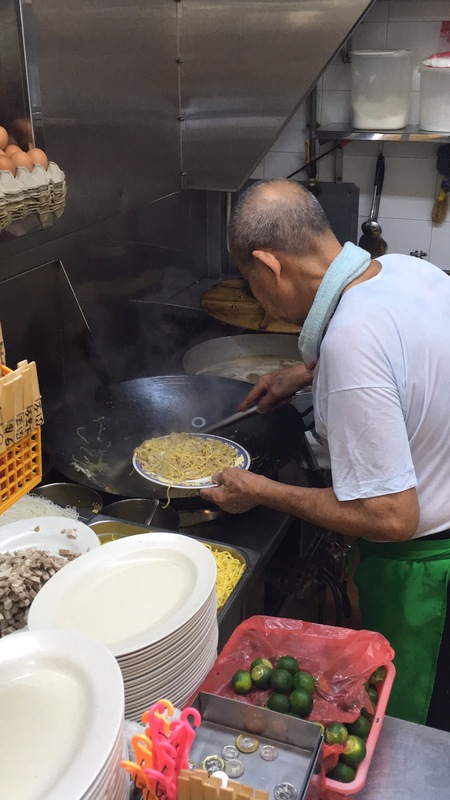 Fried one is well fried with the eggs fried in from the beginning to create the broth that simmers the noodles. By right the noodles should be good on its own but you need to mix in the sambal and squeeze the lime to get the taste they created. RTE: Given the limited time I have, I’ll come if I’m around the area. Hours: 10am-1.30pm, 5-8pm. Closed on Thu. Whenever I come to the west I totally dunno what to eat. 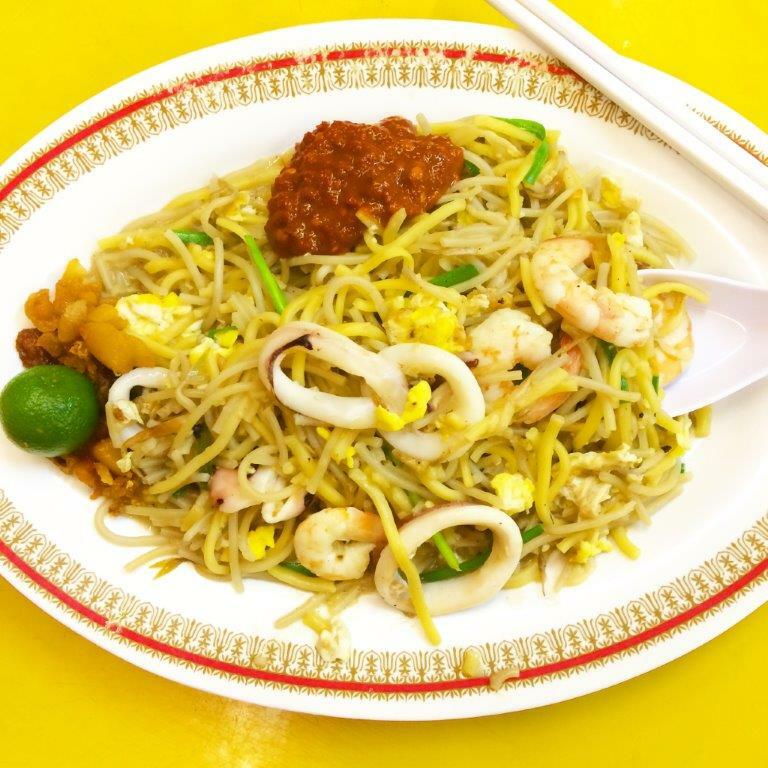 So I dropped some one near Redhill recently and I was intro to the famous Fried Hokkien Mee. So I turned into ABC Brickworks Food Centre and check it out. Little did I gel the pieces together that actually my other friends have been telling me about this place. So when I was there, I met an old Uncle and Aunty. Uncle is actually being featured in Tiger Beer’s recent uncagestreetfood commercials! 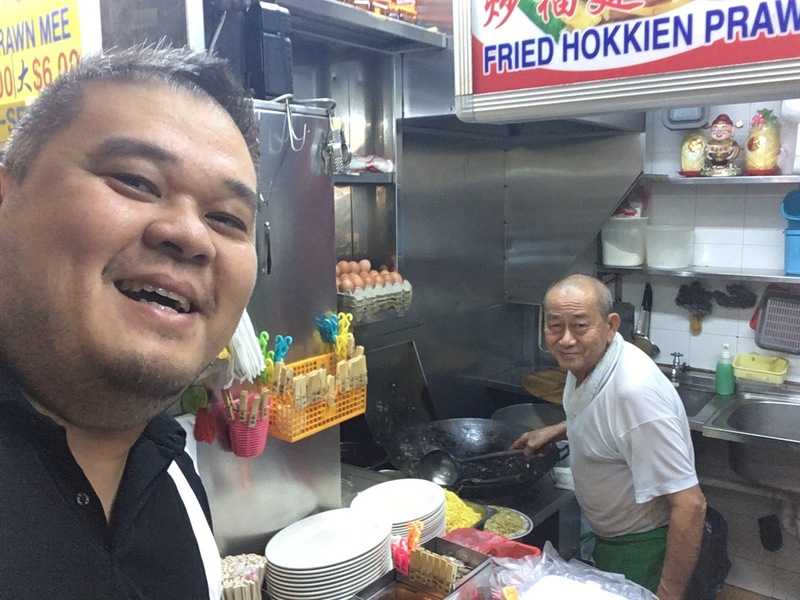 He started helping at his mother’s fishball noodle stall when he was in his teens and have been in this hawker business for more than 50 years! 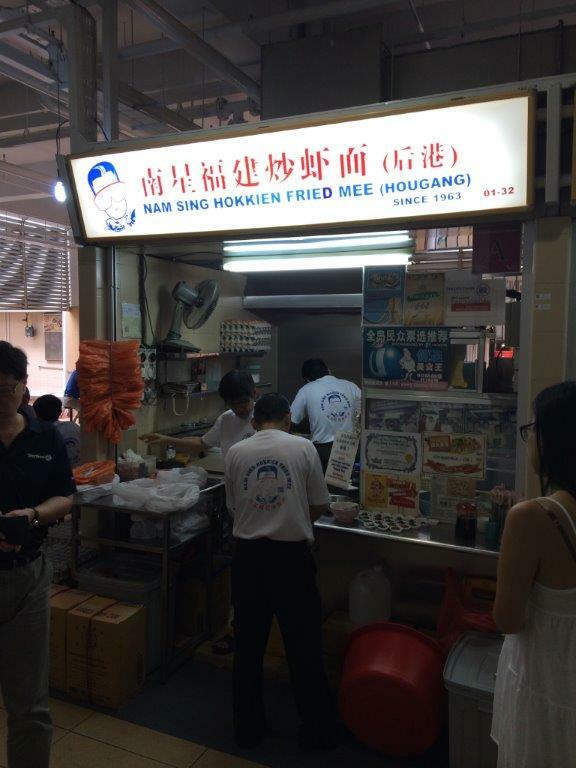 Truly a Legendary Hawker! Visited twice already since. 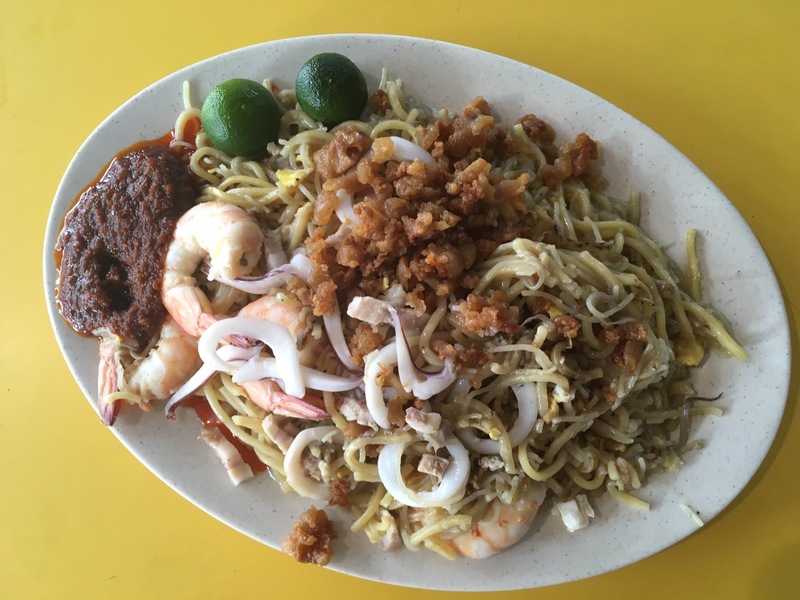 First time I ordered the medium plate, not enough… So second trip I ordered the $6 portion which was flooded with ingredients and bigger prawns! 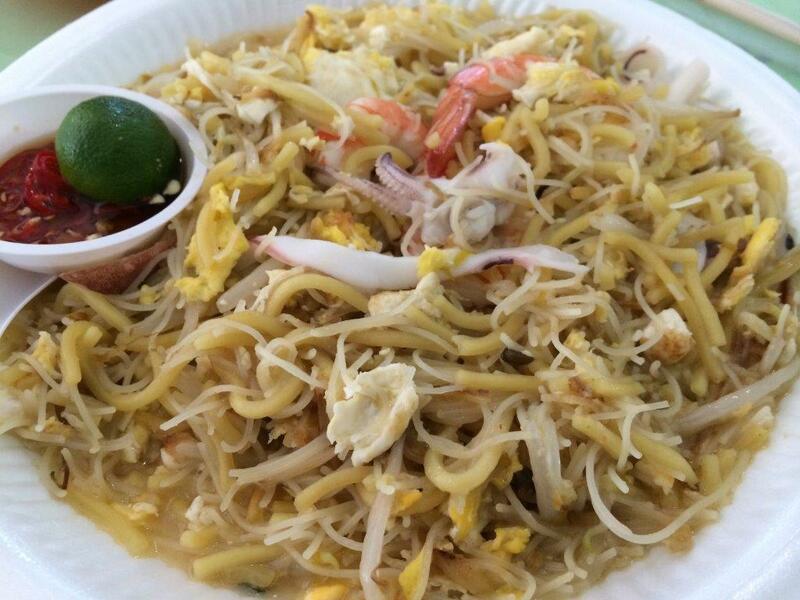 I truly love uncle’s version which soaks up all the eggy sauce and gives a nice slime coating on the noodles. Taste wise is exactly what I ate when I was young. Almost similar to Old Simon Road’s but this stall’s sambal chilli and crispy lard dressing adds on to the overall great eating experience. Yums! 5-20mins depending on your luck. Daily 9am to 9pm (Closed on Tuesdays) Avoid afternoon time cos Uncle needs to rest. After my Beef Kway Teow indulgence, I went on walking westwards venturing the whole stretch of shops and eateries towards Crawford Lane area. 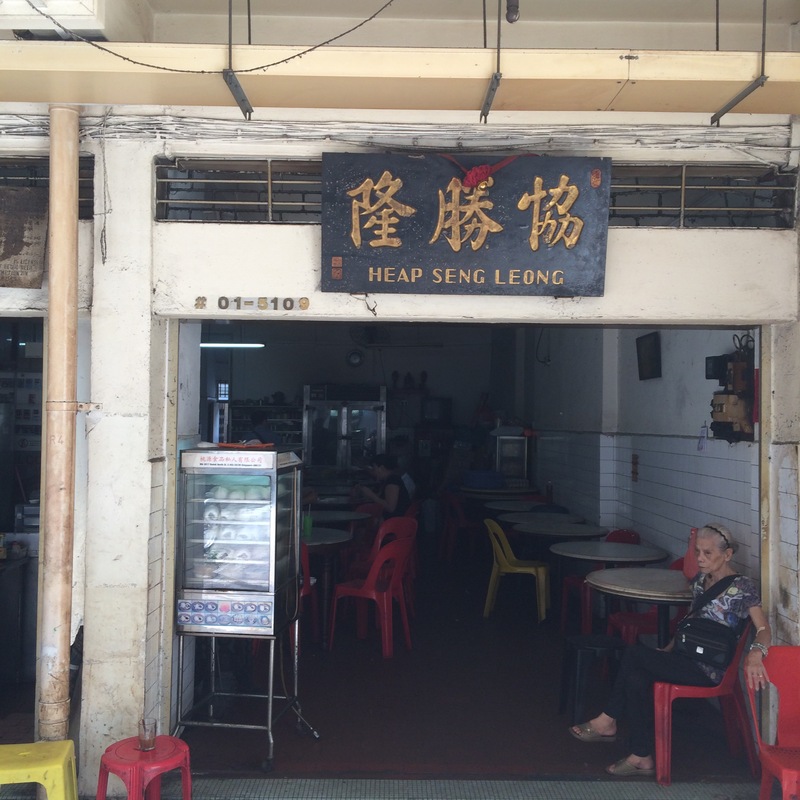 Saw a lot of old neighborhood shops and chanced upon an old coffeeshop Heap Seng Leong. 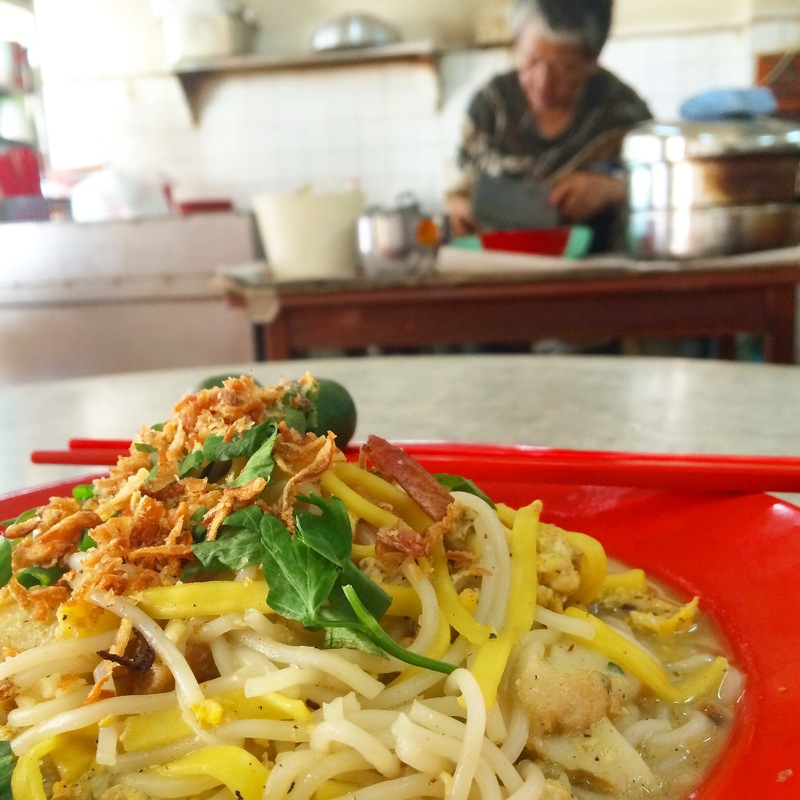 In there, there’s only one Ah Huay Hokkien Mee stall managed by an old lady. I didn’t know what to expect but went ahead to order a plate from the old granny. Ingredients are cut on the spot whenever a order comes in. Old granny in the background. Taste: Not fantastically good but you can feel old granny frying the plate of goodness from her heart like frying for her grandchildren. Very homely taste. Ingredients are cut in the spot too! Go support old granny if you’re around that area! Portion: For $3 this is a big plate! Service: Old granny is little slow so please be patient. You have to tell her what you want. 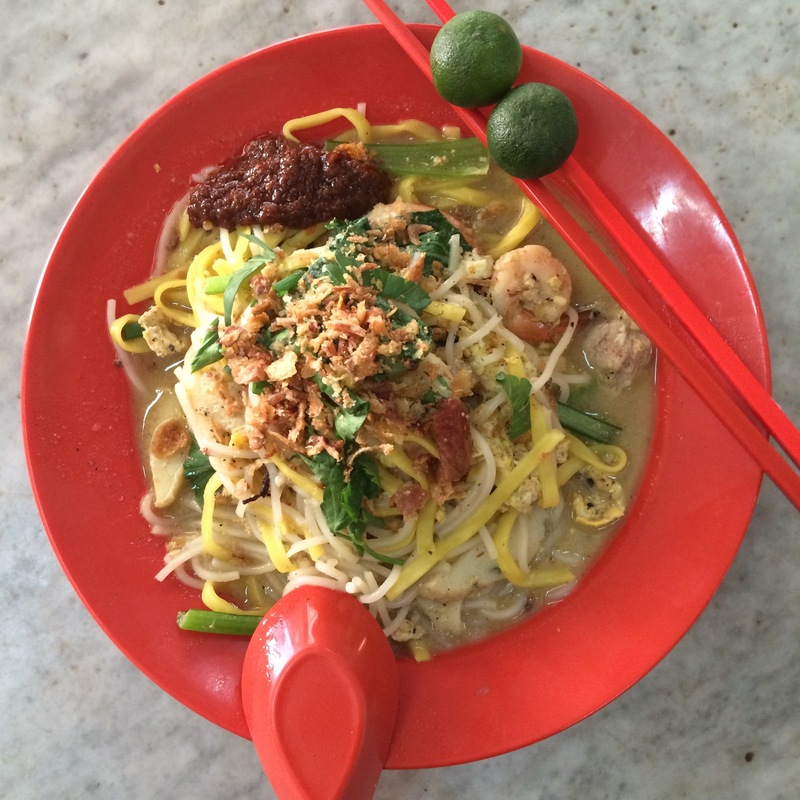 She can whip up Hokkien Mee, Fried Kway Teow, noodles soups, etc. Converse with her in dialects will be ideal. I spoke in teochew and she speaks pretty well too. Ambience: Old and everything seems to be on standstill here. Interesting marble top tables, poor lighting. Price: $3.00 only. Damn worth it. Location: Block 10 North Bridge Road. Hours: Mornings till late afternoon I believe. 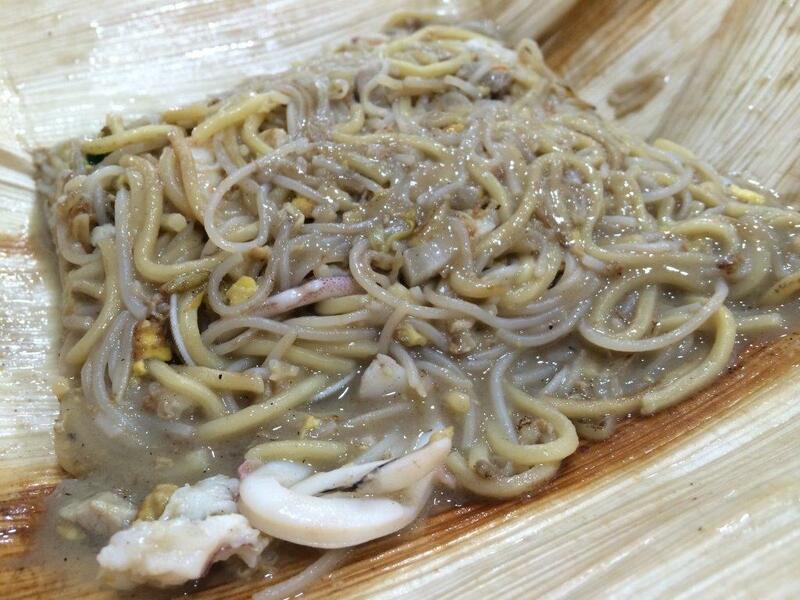 As I mentioned earlier, I was on a Fried Hokkien Prawn Mee roll and I’ve always wanted to pay this place a visit. 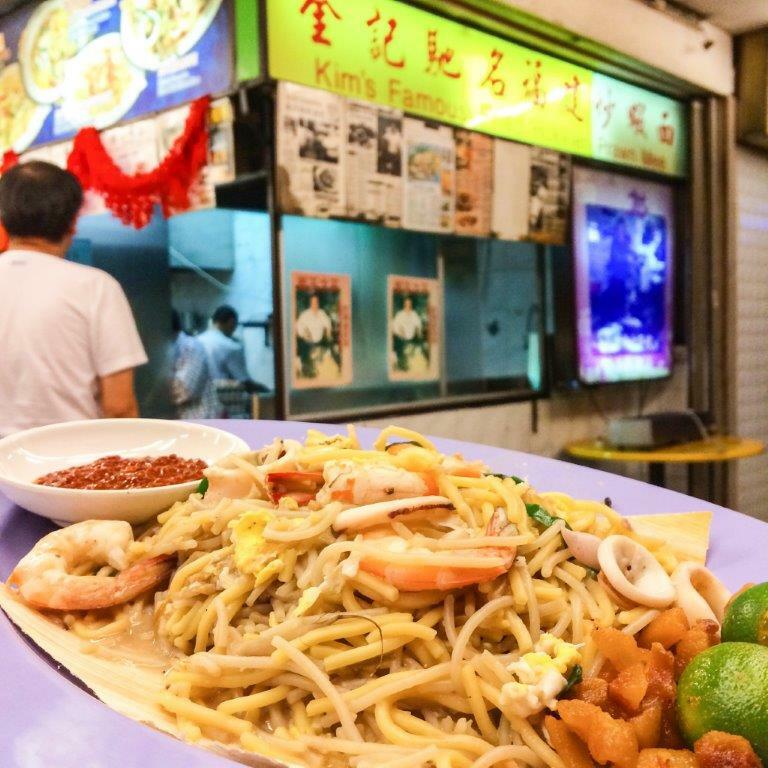 Kim’s Fried Hokkien Prawn Mee is one of the 3 pioneers for fried hokkien prawn mee in Singapore. Established in 1965, writing on this place cannot be more apt for SG50! So before I visited Kim’s, I actually heard a lot about what happened to the food quality, what happened to Mr Tan’s life and stuff. I didn’t really want to know what happened, but what I saw was the 68 year old getting his hands dirty again and frying the noodles himself… yes, he is still in his long sleeves but I didn’t notice any bling Rolex. It seemed to me that he is trying his very best to get back the original flavour and quality. 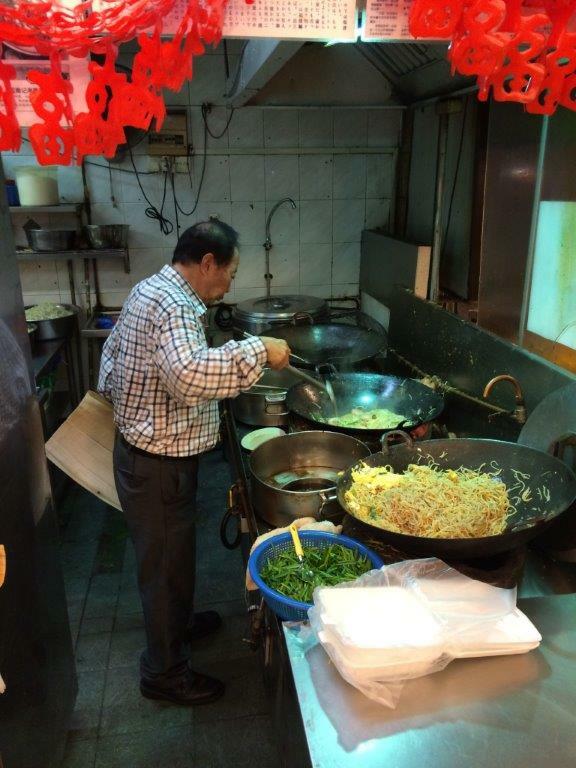 I was there on 2 separate nights and both nights Mr Tan was there to cook personally. Enough said, pictures. My order of $8 portion. Plate is big, portion is alright. 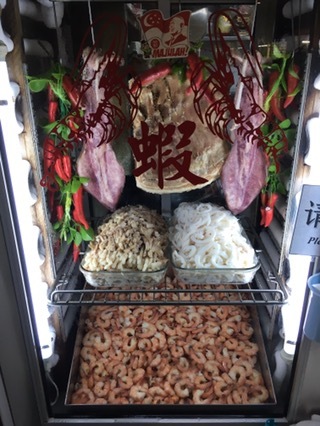 For the $8 portion you get more seafood ingredients and bigger prawns. Back a couple of days later to taste the $5 portion. Prawns are smaller but ingredients are still substantial. Taste: On the first night, I ordered the $8 portion. Loads of ingredients, good nevertheless. I went back on another night to try again if there was consistency, taste was similar if not better. However the broth could be a little richer. Ingredients was substantial for the $5 portion. Love the pork lard on the sides but would prefer it more crispy. 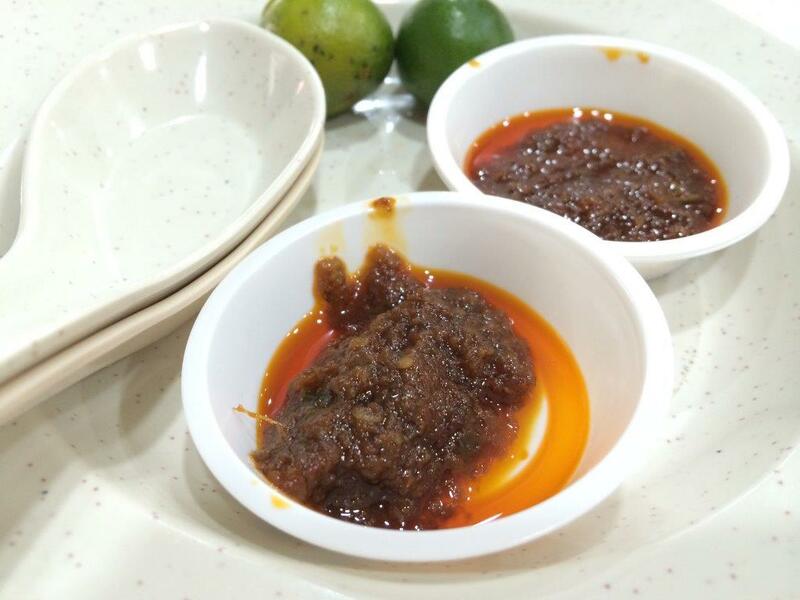 Chilli belachan was good but would be nicer if it was spicier. 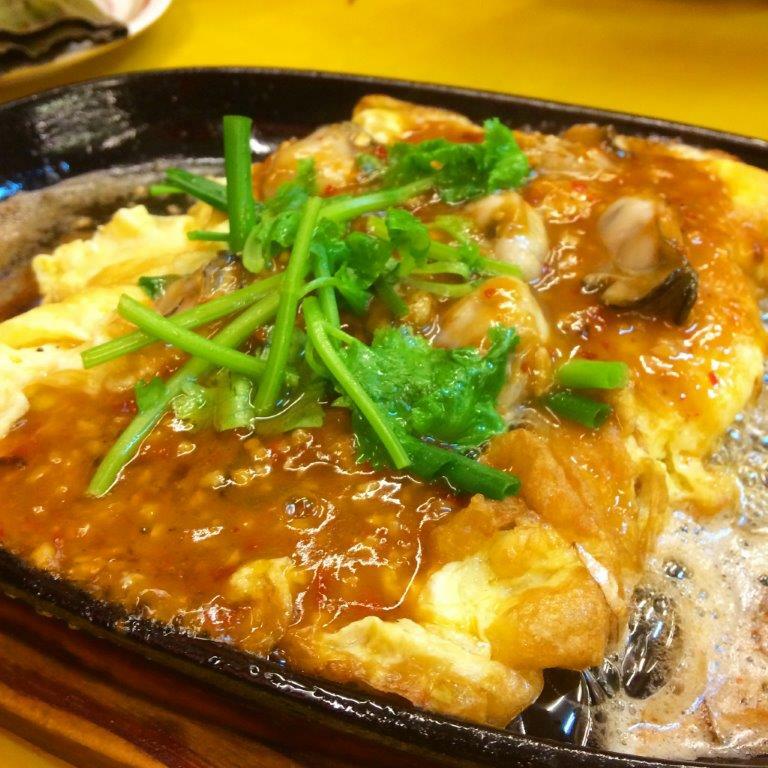 Their famous Oyster Omelette was really good, a must-order! Portion: Good. Quite a bit of ingredients. 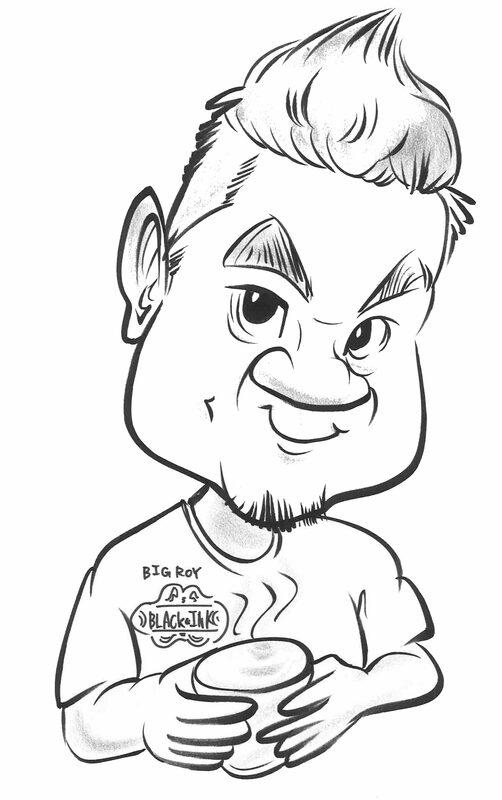 After handing down the stall to the father of the current stall owner, the business continued to flourish. Not just because of the fact they were using charcoal to fry, but also because of the overall balance it gives to the taste. Not to mention their chilli that goes with your plate of awesomeness. 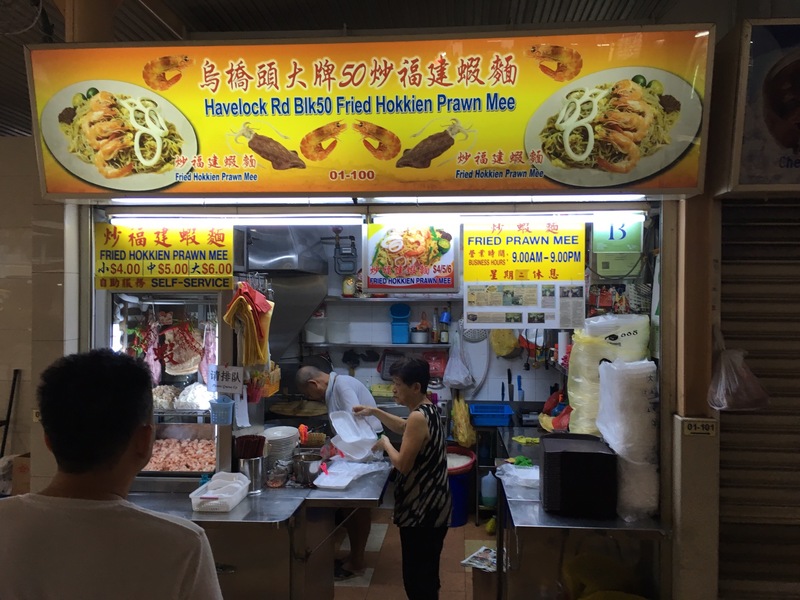 The stall has since moved to the address below, the current stall at Simon Road was their ex-worker (obviously no franchise/permission) who apparently lacks the skills to deliver that awesome plate of Fried Hokkien Mee. I tried it on one occasion and it was so bad that I didn’t write about it. But chilli was good, I suspect they got from same supplier. 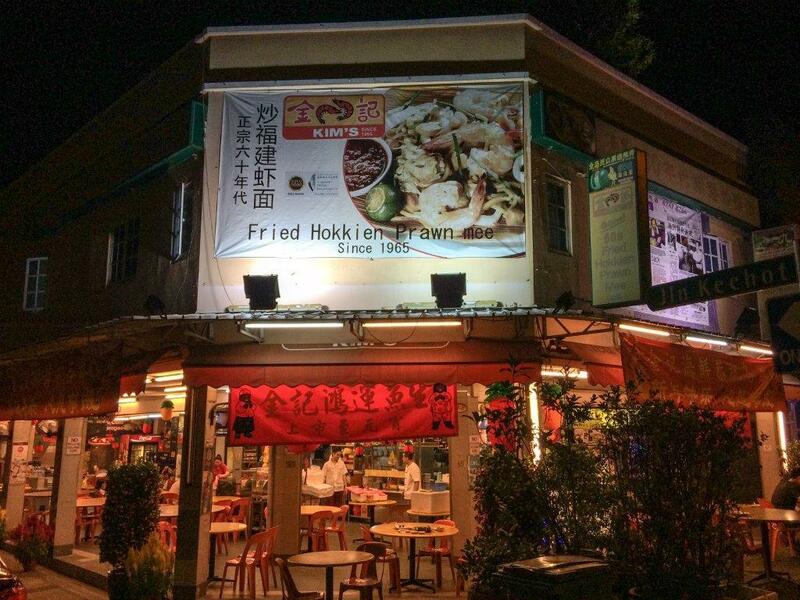 Anyways if you’re around Hougang Central area (old interchange), go check out this plate of tradition. The son on far left will be taking over and he’s the 4th generation. 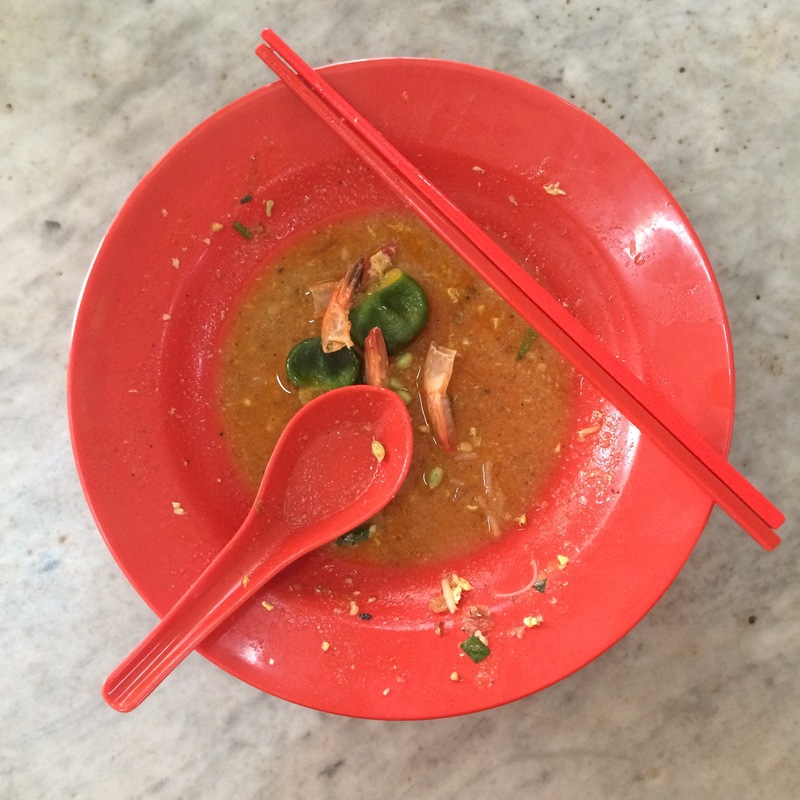 Taste: Seriously the taste hasn’t changed much from my childhood days minus the charcoal wok hei of course. But I’m a little confused by the use of 2 types of chilli but I reckon they are catering to peeps with different palates. Portion: Portion is good with loads of squid and prawns below the plate. Price: $5 for my plate. Location: 210 Hougang St 21. Opening hours: Tues to Sun, 12pm to 10.30pm. 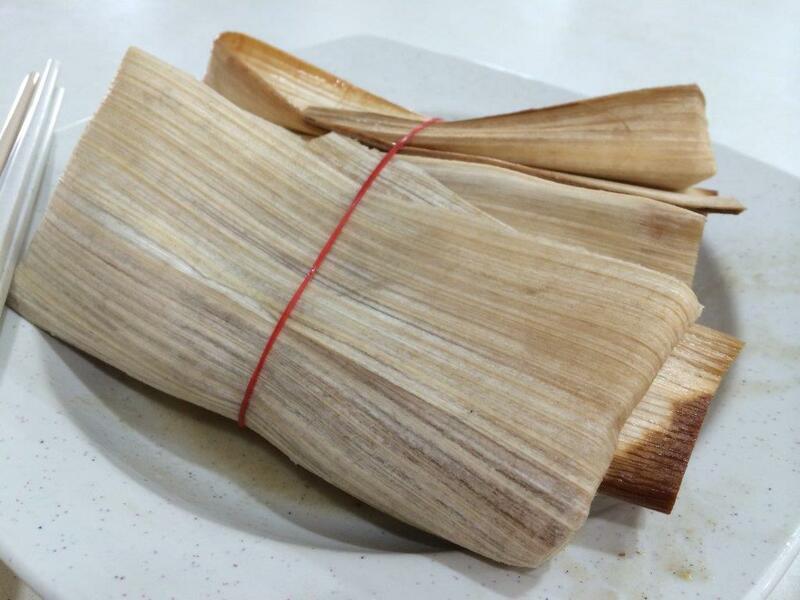 Order the Orh Peh leaf which costed $8. Nothing less. 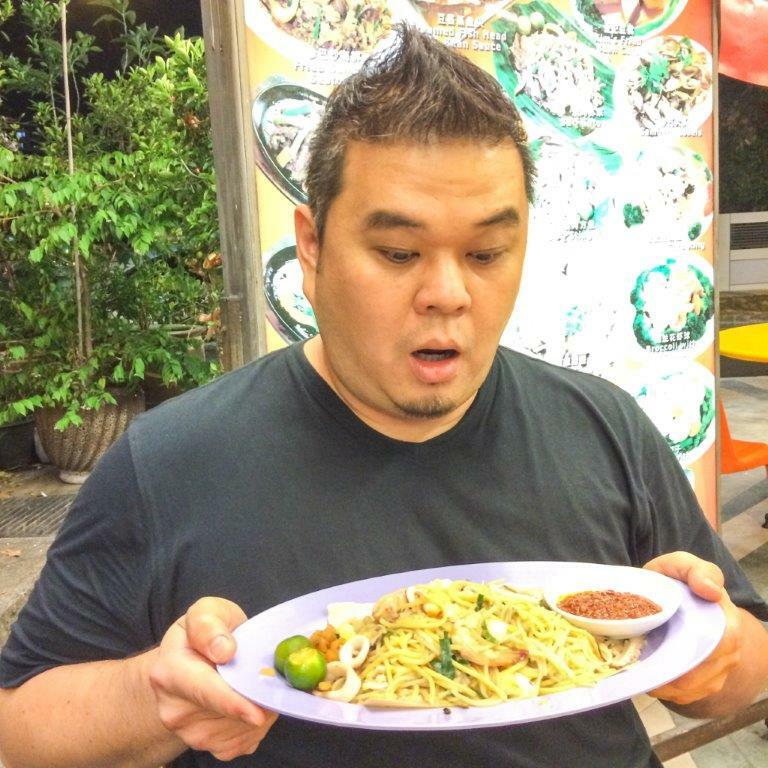 Must leave for 5mins before eating to let the aroma of the orh peh leaf penetrate the noodles. Tada! After 5mins, can’t wait to stuff my face with this! 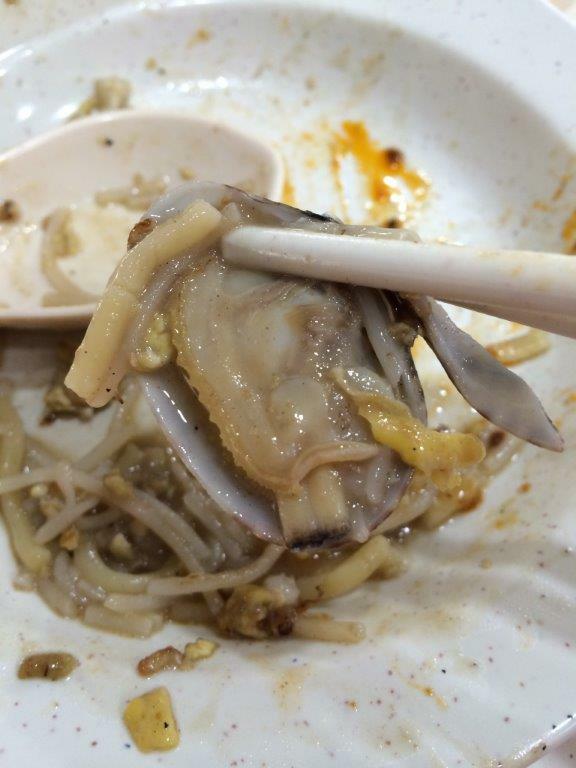 See how fat and juicy the clams are! 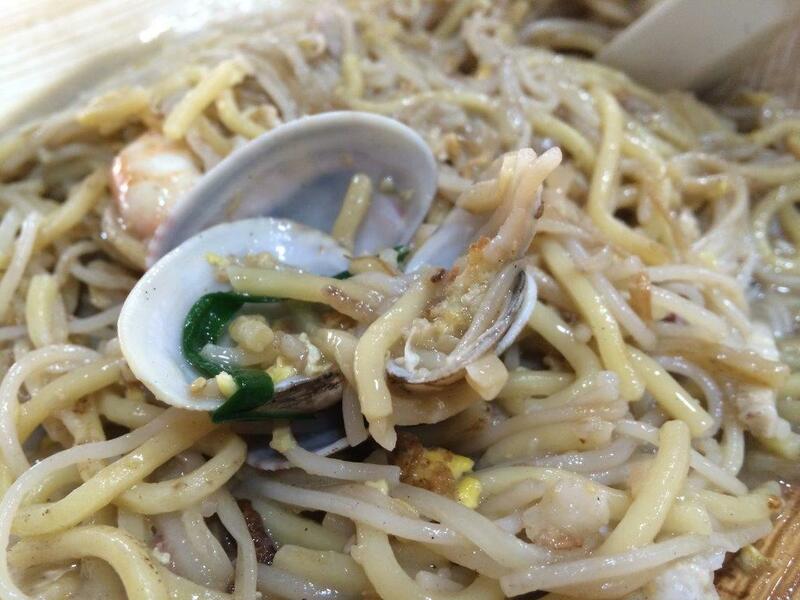 Taste: Tasted really good cos of the broth of seafood in it with clams. My only complain is the cooking time was a little too fast, ‘cos traditionally, the noodles have to be braised and covered in the wok for around 5-8mins to let the noodles soak up all the broth. 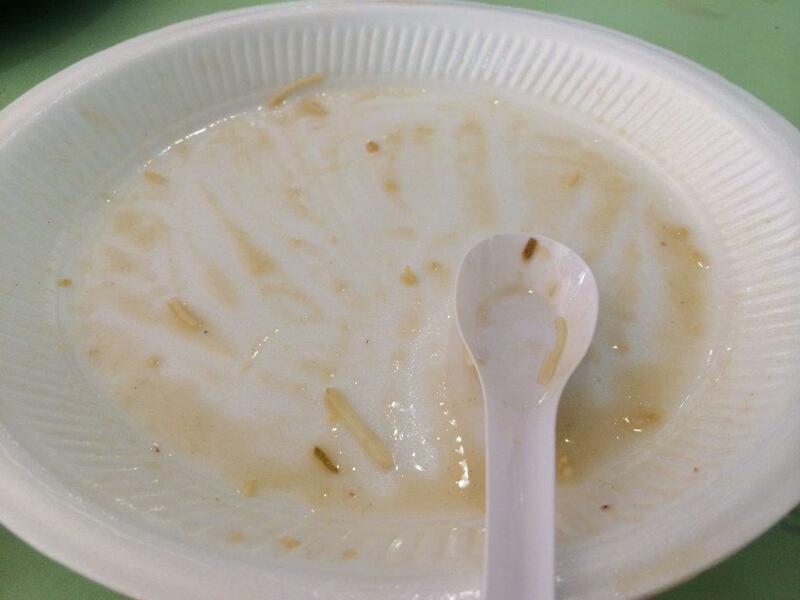 Otherwise, the noodles was good. Location: 94 Toa Payoh Lorong 4.